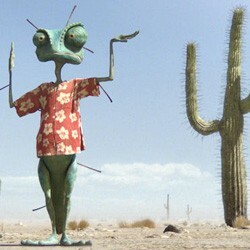 MANIC MIMIC Rango struggles to blend into a desert of the surreal. By the third Pirates of the Caribbean movie, the whole franchise had come to seem like an out-of-control holiday pageant enacted by drunkenly careening thespians with the help of high-as-a-kite designers and bored computer animators. Unless you were 12 and in love with Orlando Bloom, Johnny Depp or both, none of At World’s End made much sense. But it was too loud and relentlessly explosion packed to appeal much as an absurd fable, either. Now director Gore Verbinski — who did all three Pirates films — has made the truly exhilarating, out-there fantasy mashup those movies might have been. He just had to turn Depp into a cartoon lizard to do it. Rango is hyperverbal and very meta — qualities not normally associated with kids movies, but certainly not foreign to kids. It opens with the Depp-voiced pet chameleon directing and starring in an amateur theatrical in his terrarium, supported by a windup fish and a Barbie torso. Just as he realizes his plot needs a dose of the “ironic and unexpected,” the tank shatters, sending its occupants soaring into the Mojave Desert. Everything that follows could be reality or just an extension of the protagonist’s make-believe — but does it really matter, when that protagonist is a scene-hogging reptile? The lizard steps into a shimmering, half-hallucinatory desert (Hunter S. Thompson would have approved) and from there into a spaghetti Western. In the town of Dirt, he takes his name from a bottle marked "Hecho en Durango," à la The Usual Suspects, and his new identity from long Hollywood tradition. The downtrodden residents — toads, mole rats, iguanas, owls and a winsome little cactus mouse with a sharp tongue (Abigail Breslin) — embrace him as their new sheriff and champion. But the water is disappearing, and the tortoise mayor (Ned Beatty) is pontificating like John Huston in Chinatown. Never good. If anyone can sell metaphors and paradigms to young Americans, it’s Depp, who’s practically branded his strain of histrionic logorrhea. Between them, he and Robert Downey Jr. have turned the theater geek into a 21st-century superhero. The theme of a self-made hero who finds his identity in play (in both senses: games and theater) is surprisingly common in today’s animations, from Toy Story 3 to Kung Fu Panda. But rarely have such movies come as gleefully close to breaking the fourth wall as this one. The plot sometimes wobbles around, and the film is sure to scare young children — hell, even adult viewers will find the junk-ridden, hawk-circled frontier town of Dirt pretty creepy. 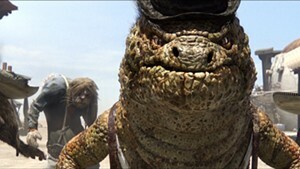 But Rango has enough rubber-band physical comedy to keep older kids entertained, whether they get the allusions or not. Chaotic and silly? Absolutely. Deep? Probably not — though the story does revolve around bank failure and people’s desperate need to believe in someone, even a hero who’s desperately improvising. But, most important, Rango’s creators aren’t afraid to veer off at odd angles like the ones in Rango’s neck, trusting the audience to enjoy both the clichés and the random deviations. That’s a method of madness as old as Don Quixote. * Running time: 107 min.